Where will YOU be when gamers and devs from around the globe descend on the world’s largest gaming expo? In a shocking turn of events, Firefly will once again be in attendance! We’re travelling to Germany next week with exciting Stronghold news, trailers, and builds of our games. For the first time we will also be revealing exactly the same footage and information to players as we will be with the gaming press. Paul, Nick and Pascal from Firefly are (nearly) ready to travel to Gamescom next week, bringing with them a touching (sorry) gameplay experience in the form of Stronghold Kingdoms on mobile and two separate pieces of new, exciting news for the Stronghold community. If you spot one of our three Firefly knights please grab them! You could be the first to experience Stronghold Kingdoms on mobile and find out what our other cool news is. Gamescom 2016 will have something for PC and mobile fans alike – for both new and veteran fans – so watch out for announcements and online community events next week! We’re running for charity and YOU can help! We first met the incredible people at SpecialEffect in 2012 and have been working with them ever since. So as part of our now yearly tradition four brave souls from Firefly Studios are running in the British London 10k for the charity, which improves quality of life for people living with disabilities. We feel strongly about the rehabilitation, mental well-being and self-esteem of those SpecialEffect work with on a daily basis, using heavily customised controllers, eye-tracking software and other innovative tools to broaden the accessibility and inclusiveness of gaming beyond fully able-bodied individuals. Still not convinced? Then watch this. In the past we’ve run as female Street Fighter characters (our best year) and Power Rangers (not the most comfortable costume). This year? 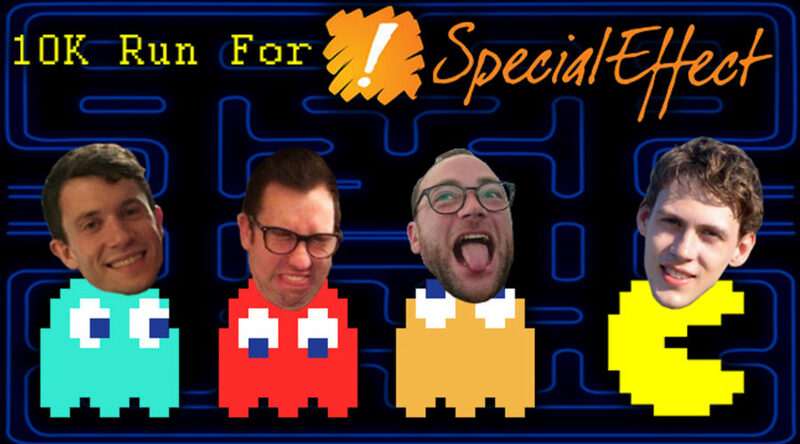 Pac-Man (Stephen) will be chasing famous videogame ghosts Blinky (Tom), Inky (Nick) and Clyde (Anthony)! What’s the only thing better than pay-what-you-want? Pay nothing! 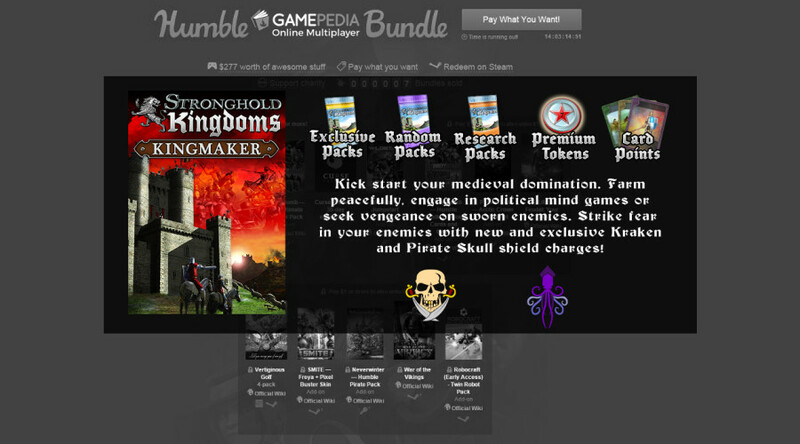 We’re giving away a limited edition ‘Kingmaker’ starter pack for Stronghold Kingdoms, as part of Humble Bundle’s latest main-page bundle. It is available right now at no charge and comes packed with over $20 worth of in-game items. Click Here to Claim Your Starter Pack! Just when you thought you were safe… Another Steam sale is upon us! Prepare for a relentless assault on your digital wallet as Steam’s Lunar New Year Sale tempts each and every one of us with bargain videogames. The best part? We’re giving Space Colony: Steam Edition its biggest discount yet, along with 75% off games in the Stronghold series! The above discounts are now active and will last until the end of the sale on February 12th. Whatever game you choose to pick up remember to add any games you have your eyes on to your Steam Wishlist. Do this and be the first to find out when we trigger another one of our world-shattering discounts! It is time. Do you feel that uncontrollable desire to grow your already gargantuan Steam Library? Do you dream of owning countless indie games, bundles and heavily discounted AAA titles? Good news! Firefly Studios are taking part in the sale that absolutely no one saw coming: the Steam Autumn Sale! These discounts are now active and will last until the end of the Steam Autumn Sale. Whatever you choose to pick up remember to add any games you have your eyes on to your Steam Wishlist and be the first to find out when the folks here at Firefly trigger one of our world-shattering discounts. In just under two weeks’ times Europe’s largest gaming convention will open its doors to literally hundreds of thousands of gamers and developers in sunny Cologne Germany. Gamescom has always been very important to us as a platform for making exciting new announcements, meeting with players and demoing our games. We have had many questions coming in about whether we’ll be at the show, what we’re bringing and whether you’ll see or hear anything new from us. The good news is that Firefly *will* indeed be making an announcement on the first day of the show! 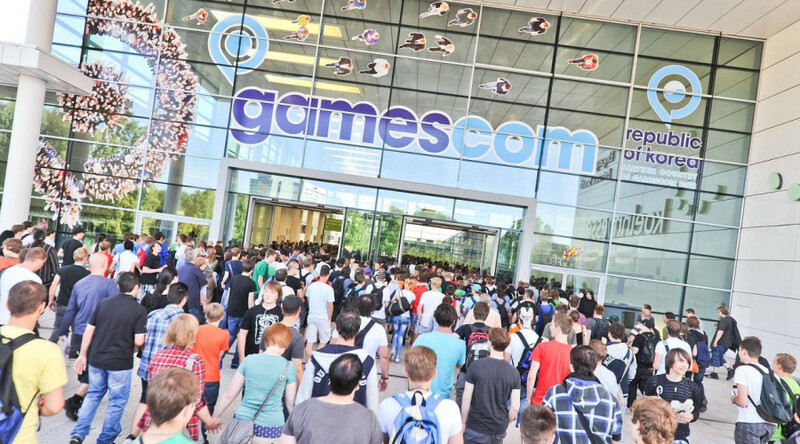 Given our attendance record at Gamescom in recent years this may not come as much of a surprise, but we do have big news and hopefully something for everyone that follows Firefly and our games. The only bad news is that we won’t have a booth in the public area for you to swing by and say hello, as we had last year. That said we do have a very special surprise prepared for everyone, so keep an eye on our websites and social media pages for updates between the 5th and 7th of August if you don’t want to miss out on our exciting news! Fireflyworlds.com is dead… Long live the new Fireflyworlds! We are pleased to present the new official Firefly Studios website. Designed to make it as easy as possible for players, press and anyone interested in our company to get technical support, press assets, review code and information on our latest endeavors, the new website has been created with all devices in mind. Desktop PCs, laptops, tablets, mobile phones and almost anything else you can use to surf the web in 2015 (apart from smart watches… At least for now) are all supported, with a dynamic theme that will magically shape-shift depending on the device you’re browsing from. Are you for some reason in search of an old newsletter, FAQ, mini-game or wallpaper? Fear not! In our benevolence we have made sure that the old Firefly Studios website is still available for your viewing pleasure. 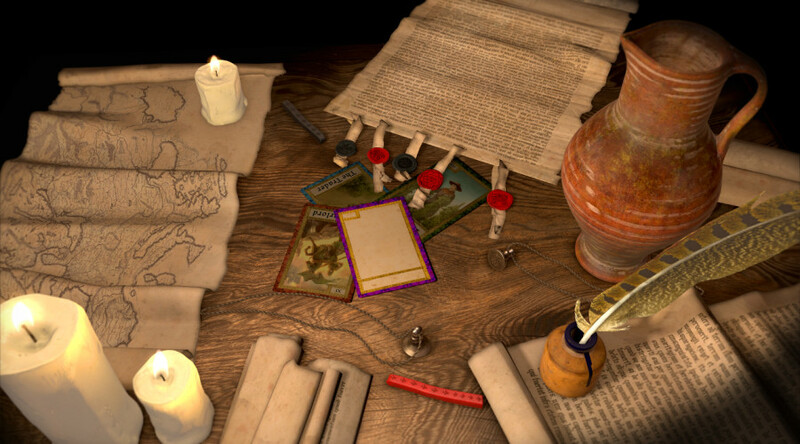 Feel free to visit ye olde Fireflyworlds for information on our older games and to browse the forum for threads of the past. While we may eventually add information on our legacy titles to the new Firefly site, we will likely do so only when relevant updates (such as multiplayer solutions for ex-GameSpy games) have been developed and released. 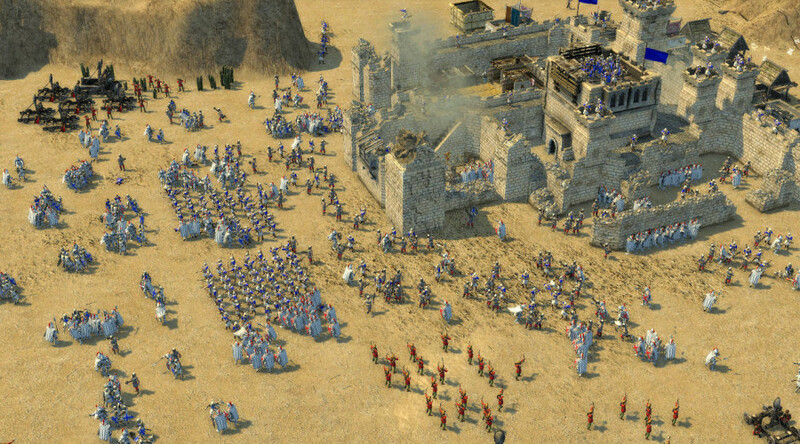 We will of course continue to support both the official Stronghold Kingdoms and Stronghold Crusader 2 websites. We hope you like the new website! Be sure to check back for the latest news on new updates and games from Firefly.